Today is a bit of a busy day, we are busy trying to get the nursery together since I only have a week and half left until this baby boy gets here! Crazy! This is the PERFECT meal for a busy day! On mine and my hubby’s first date we went to Wingers. Now we go back every year on that day to celebrate! 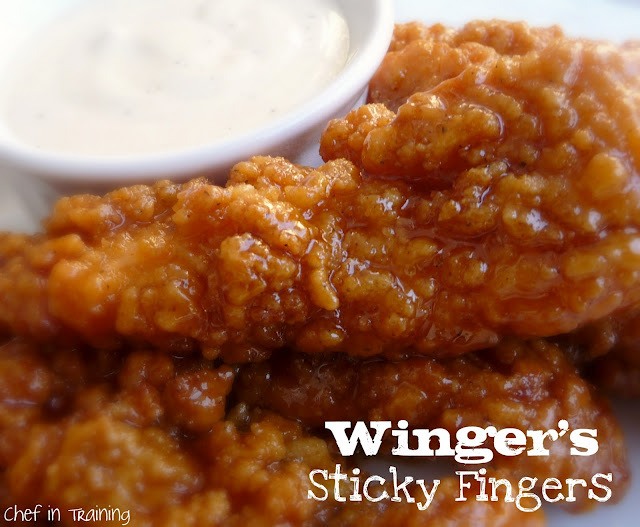 Wingers Sticky Fingers are amazing and mainly because of their sauce! This recipe is almost identical to it! For the chicken…I just buy a package of Tyson’s frozen breaded chicken strips and bake them according to their conventional oven directions. Heat sauce until sugar is dissolved, then pour over chicken! Serves about 2 with a little left over….so 2 for the price of 1! Thanks for your visit. I'm your new "learner" - I will try some recipes... (and maybe I will add some scented pelargonium leaves to them). Ok cute stuff...you are the most amazing "chef in training!" Love your recipes!!! Hmm, wonder if it might be too spicy for my kids. Only one way to find out! My 12 year old loves wings so I may have to try this!!! Good luck getting your nursrey together!! It all goes so fast doesn't it! We LOVE Winger's, but don't get to eat it since we don't live out west anymore. Once we got stuck in Laramie, Wyoming overnight with car trouble, & ate at a Winger's down by the university football stadium; it turned out that was the very last night they would be open because they were going out of business! Too bad! Hi Nikki, I just love your blog. All of your recipes look delicious. I really don't like to cook much...actually I used to until everyone in my family decided that they want something different to eat at every meal. I'm going to give some of your recipes a try. I'm now following you back and putting your button on my sidebar so I remember to check for new recipes. So simple!...I love this one. I'm into the semi homemade definitely. It's got to be fast and good, right! OMG...these look insanely good!! My sisters and I just started our first themed blog hop over at http://everydaysisters.blogspot.com every Sunday!. This weeks theme is appetizers. We would love for you to come over and share these or any of your favorite appetizer recipes with our blog readers. Have a great weekend. Oh my gosh! These look so delicious and easy. Freaking yum! I wonder how that sauce would taste on grilled wings---I shall give it a try! Another FAB recipe! Can't wait to try. I'm hungry just thinking about it. Just made this for dinner last night, the whole family loved it so much that they want it for dinner again tonight! Thank you!!! This recipe is amazing and tastes exactly like the real things! The left overs were great in a salad the next day. Since it is hot sauce, I am guessing that it is spicy. Does anyone know of a substitution that can be used for the hot sauce since I am a wimp when it comes to spiciness? @Anonymous I am a whimp when it comes to spicy too. I use Frank's Hot Sauce Buffalo Flavor (make sure it's not the Hot Buffalo) and I don't think its too spicy. If you dip them in ranch, it mutes the flavor even more. Let me know if you do end up switching it out for and how it tasted! You're a magician! This was SO GOOD! and way cheaper than going to Winger's one bag of chicken just wasn't enough for me! These are so good. Thanks for the recipe! No these are not spicy. The brown sugar gives them a sweeter taste (but still a little kick)to balance out the hot sauce. These are delicious and super easy to make!! I love your site!! Delicious Delicious Delicious! That is all I can say.. My husband was like OMG what did you do.. These are the best!!! These are reallllly tasty!! I couldn't find the tenders, but I did find all white popcorn chicken...my kids even loved it, sauce was very tasty even better once the popcorn chicken was tossed in it..mmm thank you again!!! This looks yummy--I have everything to make it for dinner tonight. I love Winger's and I don't live close to one so this was exciting to find. I made this today and my husband and I agree that it's delicious, and close to the real thing but not quite there. I think I could remove close to 1/3 of the brown sugar to get things right on. It tasted too sweet which covered up the spicy sauce but I am confident on my next try that I can get this right on. It really is delicious! This was delicious! My husband raved the sauce. I've honestly never seen him react to something like this that I've made in awhile. We've never been to Winger's but this sauce is the boss. Just double checking - this recipe is for the whole bag of Tyson chicken strips, correct? Making this tonight and can't wait to try it! Your recipes all look delicious! Thank you! Wll you ever v a pt of Ziplist???? ?